ANNOUNCEMENT: We are NO longer an agency! Today’s episode is a special announcement about my company. Hirsh Marketing is making a huge pivot from “ads agency,” because we’re MORE than an agency (and always have been). In fact, we’re shifting our language to reflect a movement toward ANTI-agency. And today’s episode is all about why. If you enjoy this episode, share your takeaways inside IG stories (+ tag @emilyhirsh for a shoutout!). We’ve started a movement. Help us spread the word! [1:39] I refuse to be part of THIS trend. [4:00] Why most agencies fail their clients. In today’s episode, I have some exciting news, an announcement and a huge shift in the Hirsh Marketing brand in business. And that is we are no longer considering ourselves as a marketing agency, we’re removing agency, anti-agency, we’re doing some major shifts because of this. So I’m going to give you guys some background information and why we are doing this, why I believe this is true and what sparked this. So first of all for the last year, I’ve had my business for three and a half years, and I’ve done Facebook ads for that long and built my team and done marketing, and essentially as I’ve grown my company and grown my team, the service that I’m providing has grown more and more. Because now an ads team who’s managing our client’s Facebook ads is not only managing their Facebook ads, but is consulting on their marketing and their landing pages and their sales strategy and their webinar because I’ve added in, strategists. I had a massive realization this week, but here’s what happened, to be honest in the last year I have become super sick of ‘agency’ becoming the new biz op. I get asked all the time to make training material for other agencies because of people who want to learn and I actually refuse to do it. One, because lack of focus is killer for a business is the worst thing, but two, because I refuse to play a part in it. I think just because you know how to run Facebook ads or you know how to manage Facebook ads, how to set up ads and you know funnel strategy and you know digital marketing strategy, does not mean you’re an agency, does not mean you should consult on marketing and does not mean you can provide the level of service that most people need. And for the last year, I’ve honestly been really sick of people coming to me burned from a quote, you know I’m doing air quotes right now, “agency” who was like 3 people on their team and calling themselves this amazing agency. And so, I have built the opposite of that, and I am taking a stand and our company is taking a stand and really boldly going out there and saying, we are our own category. We’re not an agency, we’re not a marketing firm, we’re not a consultant, we’re not branding, we’re not sales, we’re all of these things. 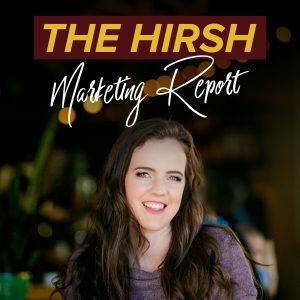 We’re Hirsh Marketing, we’re a marketing management company and to be honest with you, I’ve yet to see what we’re doing exist out there at this level because we’re not an agency, and I don’t want to be in that box anymore of an agency. So we are no longer considering ourselves that, and here’s where I realized it. It’s because I’ve always just built a team to give the level of service that I think that my clients need, so one of the things that has made me different from pretty much day one, is that we do the ad copy and the creative. Well if you go sign up with other agencies, majority of them don’t actually offer this service, they don’t have a design team, or copywriters on their team and so then they require that the client does it for them. And then gives the agency the ad copy, the creative and then runs the ads. To me that’s like a massive gap, because creative and messaging and ad copy and headlines and the images are one of the most important things in the ads. 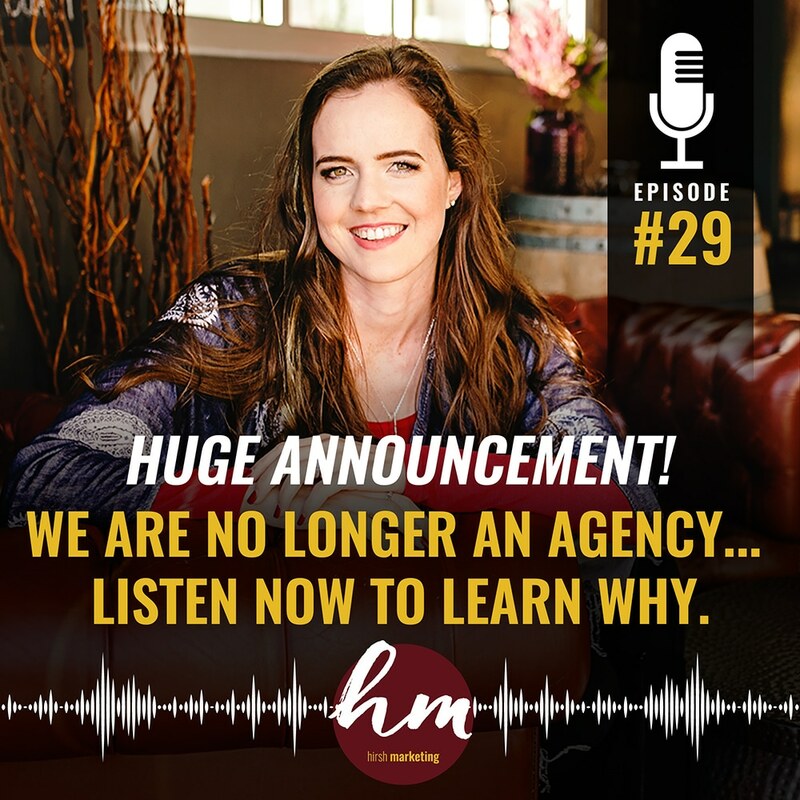 So if you’ve siloed yourself where you’re the agency, you’re just getting these things, you’re already setting yourself up for potential failure, setting your clients up for potential failure. So I’ve always had copywriters and designers that I offer to people, because here are the three things that you need to run ads successfully, and I’ll tell you what an agency does. The three things are one, you need the day to day optimization scaling, turning off ad sets, changing around your budget, monitoring the ads, monitoring the audiences, loading the ads like tactical optimization piece, in your ad account every single day, right? That’s one thing you need when you run Facebook ads. That’s basically what an agency does and should do. But the other things you need are number two, consistent high level and big picture long game, marketing and sales funnel strategy. So this means not just looking at the ads, but looking at the landing page, looking at the emails, looking at the conversions, looking at the sales percentage conversion, looking at the webinars, looking at the messaging, looking at the branding, looking at all the stats. And then also looking at where is this business going in a year from now? And big picture, we are building a brand, we’re not just driving traffic, we’re building a brand and a following, and the ads are a piece of that. But if you’re lacking a marketing team and a sales funnel strategy and marketing piece, you have a huge hole and a huge gap. And then the third thing you need, is an amazing to-die-for creative team of copywriters and designers, who know messaging who can understand your ideal customer and those pain points and relay that in the ad copy and the ad creative: the images and the headlines. Some agencies do provide it, I’m not saying we’re the only marketing team that provides creative, they do. But majority, like an agency doesn’t normally do that piece. They require that the client brings the creative to them, then they run the ads. So an agency is honestly a team who, you bring them the funnel and you say, “Here’s my funnel, here’s my converting landing page, I already know that it converts at this amount and I’ve got my webinar, my sales and all of this is taken care of, now you just drive traffic to it.” And that’s normally what an agency’s job is, right? To just drive the traffic to, they live in the ads manager, they’re managing the ads, like they look at only the ads, and that’s their job. And that’s fine right, you need that piece, but to me that’s one of three huge separate things that you need. And I realized that nobody was really providing this service as if you built, if you were to build an in-house marketing team, if you look at these multi-million dollar corporations and companies who do have in-house marketing teams: they’ve built these three core components within a team, and they’re honestly paying at least $100,000 a year in salaries (but probably way more than that, it depends obviously on the size of the company). But you need those pieces, right, to really excel with your marketing and we have been doing those three pieces forever because you need that, right? If a client came to me and they didn’t have those, I just started offering it. And so what I have recently changed in the last six months is really, the level of my team. So I’ve added in layers on an account, so a client gets an Ads Manager on their account but they also get a Senior Strategist on their account who’s there only for big picture strategy, and not just ad strategy but sales funnel strategy and then on top of that, in the last two months I added a Director of Strategy on my team who runs my strategy calls, who has 15 years of digital marketing experience. And my Creative Director who’s also on the strategy call, hitting the messaging. And so we are hitting every piece, and we’re not an agency. We are not an agency because we are a marketing team, a marketing management team who covers everything that you would need if you were hiring an in-house person. So because I’m sick of the agencies being the latest and the greatest biz op, I am removing that from my team’s vocabulary, from our vocabulary and we’re shifting things. We are shifting things in the company, we’re looking for what we’re calling Hirsh Partners, those are our clients, Hirsh Partners for life, for the long game for growing a business. We are so invested in the success of our clients that they are partners to us. And so we will be shifting our model and what we are charging because yeah, we’re going to be one of the more expensive out there, but we’re not an agency. We’re not just doing Facebook ads because that’s not what you need, unless you have it in-house and you need an agency because you’ve already got all the funnel marketing consulting and the creative and the strategy and the ongoing consulting in place, but most people need more than that. And that’s what I’ve found and that’s what I’ve accidentally built, to be honest, because I kept adding layers until it felt complete. And now you have an entire marketing team, if you’re one of our clients you know this is true. And so we’re looking for partners now, and our clients will become our partners long game, and that is our clients, our current clients. They know that, we are so, so invested in the accounts and we actually have made the decision that on December 21st, of this year, this episode when it comes out that will be very soon if we timed that right, we are actually closing the doors completely for the rest of the year to come on to our roster as a partner, and that is because we’re going to be maxed out with the level of service that we provide. So we are closing the doors and if you’re in from December 21st or before, then you’re in. And if not you have to wait until early to mid-January to be able to start the new year with us. So we’re doing that announcement this week, and then we really are closing the doors. And we won’t be letting any clients come in and start no matter how much you beg, because another thing that I care about so much, I have put everything into it this year myself personally, is our delivery to our clients and the results we’re able to provide. And we know what we’re able to do, and we’re able to take on a couple more, of what we’re calling partners in our company. And then we’re completely shutting the doors. So if you think you want to work with us and you want to jump on that before spots totally fill up, you can go to helpmystrategy.com to apply to work with us and our pricing structure has already changed. We are definitely not the cheapest because we’re not an agency, if you go find an agency charging $1,500 a month and small monthly retainers, I guarantee it, they’re not invested. They’re not invested, they don’t have the team. I could do an entire podcast episode about the problems with agencies because here’s the other thing: part of this came from, I went and spoke at an event, a couple of weeks ago that was all for agencies, which I love the people there, they’re amazing people. But I went and spoke about team building and how we hired, trained, all of our ads team, and I had multiple people come up to me and not only say, will you sell me training because we have nothing compared to what you have, for running your teams, and the systems and the structure and the operations. But also, I’ve had two different people come up to me and one said, I used to run a department that was doing $20,000,000 in a massive corporation and I ran this whole department and we didn’t have half of the systems that you just shared with us in this one hour. And to me that’s like, when I realized that and what we’re able to deliver and be invested in our clients. I realized that we’re not an agency. Because an agency, and a lot of them out there, charging these $1,500 or $2,000 a month retainers. They will not be invested because they’re trying to get as many clients on their roster as possible, keep their costs low. I can tell you 75% of that room was trying to hire from the Philippines and outside countries which I obviously don’t have a problem with those people, but it’s very hard to find quality, invested people in your team who will serve your clients what they want. I have all US and Canadian team. And they don’t have the systems because they’ve grown too fast for their demand. And we step back and say, we are full. We can’t take on any clients, our roster is full. And we are two spots, two more partners, two more Hirsh Partners away from being completely full, and then we’re closing the doors until the new year, when we have that open again. Because the delivery is what’s allowed me, the fact that I can deliver with the systems we have in our company is what’s allowed me to scale to where I am, which is over 70 clients. So that is my huge announcement, we’re no longer an agency, we’re Hirsh Marketing, we’re The Hirsh Marketing Management Company in our own box. 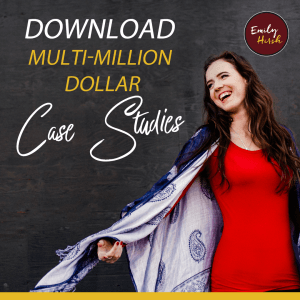 I basically have created what you would essentially have if you had you an entire marketing team on your team, that doesn’t just do the Facebook and Instagram ads, but is doing the marketing, consulting, the webinar strategy, the emails, the landing pages. And not just able to do them, but the strategy consulting on them and watching the data of them. And I have had multiple influencers as we rolled out our Dream 100 project and I talked to these multiple, multiple million dollar companies, come to me and say, right now we have a marketing team over here doing our funnels, and an agency over here doing our ads, and there’s a disconnect. And we’ve never been able to find somebody who can do both in one roof and do a good job at it. And Hirsh Marketing we are those people. We are because we have been for the last year, I’ve just kept myself in the box of an agency but I’m not an agency. I am a management umbrella company of providing everything that you would need with your marketing, and we’re very picky about who we work with. Because we’re looking for those partners who we can invest in their profit growing, month over month and are super incentivized by that. And super dedicated to our clients, so if you think you’re a fit, helpmystrategy.com and if you’re not, that’s fine. I know I have a lot of listeners on my podcast who not at quite at that level to work with us yet, and all I will say is just be careful, as you roll out getting marketing help, because if you’re lacking in the marketing strategy and consulting and funnel support and you go run paid ads and there’s a separation, there’s a disconnect, it will waste your money. It really, really will and you might as well wait until you can really afford having both. And whatever the way that means, like regardless of how you bring in that help, if it is in-house or if it is from an outside company, it’s just very few companies are able to do it all. I mean not do it all, I never would say that actually do it all, but in terms of every piece that you’d need for a successful marketing campaign’s do it all, which is those three things, the tactical pieces, the big picture strategy and then the creative team. There’s very few companies able to do that, because I will single handedly tell you it’s very hard to scale and it takes a ton of effort putting in the systems, where most CEO’s or business owners don’t take a step back to actually put time into their systems because they’re so busy with their client acquisition. Where this year, I’ve turned down plenty of people who wanted to come and work with us, and were begging to work with us, because we either were at capacity, or they weren’t the right fit but because I value the delivery so, so much and that’s the key and that’s what’s rare to find. So helpmystrategy.com, December 21st, we will be shutting down doors, closing doors for the rest of the year for 2018, to come on and become a Hirsh Partner, if you’re the right fit for us, we would love it if you came on. But if not, continue listening to the podcast and I’ll continue giving my value. So thank you so much you guys, for tuning in today.